I’m an avid iTunes customer who’s been making purchases since the first week the service went live. I typically buy more albums than songs. When I buy an advance track from an unreleased CD, I usually wind up paying more for the complete release. That’s very frustrating. 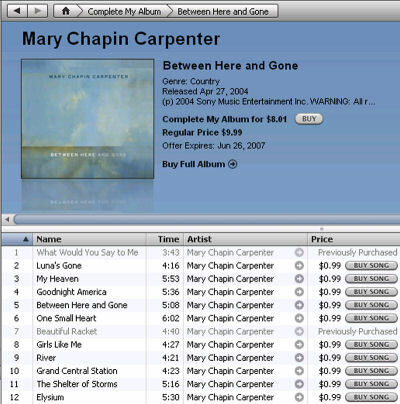 For example, I bought two tracks from Mary Chapin Carpenter’s “Between Here and Gone” back in 2004, and when the album became available, I had to get the remaining 10 tracks at 99 cents each. Had I waited for the album, all 12 songs would have been $9.99, but in this case I wound up spending $11.89. That changed today with Apple’s limited-time “Complete My Album” offer. You can, until June 26, add the rest of any album you’ve purchased tracks from for a price that represents the iTunes cost less what you’ve paid for the songs you already own. I’m not sure why my account indicates the other 10 songs as missing. As I said, I filled out the album back when it was released. I’ll be in touch with Apple to find out about this bug; you shouldn’t take the store’s word for it either, lest you buy songs twice. However, this discrepancy allows me to demonstrate the feature, even if I was too late to take advantage of it in the case of “Between Here and Gone”. “Complete My Album” works with all music purchased by the track from the iTunes Store. When you click on the link (located on front of the ITMS page), it looks up your personal account information regardless of which computer you’re on, or what music’s stored on its local hard drive. Thus, if you have more than one account, you’ll need to log out and log back in to see details for each. One thing to remember is that you need to navigate to your purchases via the “Complete My Album” button on the ITMS front page in order to be given the option to add unpurchased tracks. If you go to the album from the artist page, or search for it, it won’t show tracks already purchased. This is a problem mainly if you’ve bough lots and lots of individual tracks. Near as I can tell, and I’d welcome additional input on this, there’s no way to go straight to an album you’d like to complete. You must choose a sort order and scroll page by page (25 albums a page) until you reach the desired disc. A friendlier interface would be nice, but I’m glad that iTunes is making this feature available, if only for a short time.